With its appealing, cool and crisp luster, sterling silver jewelry combines the endurance of a precious metal with an uncanny ability to adapt to fashion's demands. Sterling silver will always be an element of style. It is an indispensable metal. Sterling Silver is a Precious Metal, just as Gold and Platinum are precious metals. Sterling Silver is the most reflective metal. Silver is the whitest and has the greatest luster of all the metals. This means sterling silver can be polished to "give back" as much light as hits it (99%). When silver is against the skin, you benefit from this white reflection. It brightens your complexion! Sterling Silver compliments all complexion colors and skin tones - it will brighten your skin's appearance. Silver alloys readily with copper to manufacture sterling silver jewelry. The copper is added for strength and durability because fine silver is so soft. Sterling Silver jewelry is usually marked by a 92.5 symbol. This indicates true sterling silver comprised of 92.5% silver and 7.5% copper. Compare this to the 14k mark on gold which consists of only 58% gold - the remaining components are silver and copper. In the 1300's, King Edward I ordered all silver coins be stamped with a number to indicate the silver content. He did this to ensure the coin's quality and to identify the name of the city where the coin was made. This custom of stamping jewelry was adopted throughout the word and is still in practice today. Thus, the 92.5 stamp. Sometimes, included is the country where the piece of jewelry was made. Silver is rarely found in nature in its pure form but as a component of other ores. Most silver today is retrieved by refining other metals such as lead and copper. As silver is exposed to air, it tarnishes and looses its luster. This is a natural process of the sulfides in the air oxidizing the metal. At first, tarnish has a golden hue and then black. Humidity and air pollution affect the amount of sulfides in the air. The problem of silver tarnishing was unheard of before The Industrial Revolution polluted the air. Go to information about and products for: caring for, cleaning, storing, and preventing future tarnish for your sterling silver items. Long ago in Asia Minor, silver was held in high esteem and displayed as a status symbol. In the earliest Egyptian records, silver was more precious than gold. Wearing silver was a social privilege reserved for the upper class and wealthy. By the 18th century, a new fashion fad surfaced in Europe, silver buckles on shoes instead of laces. Believe it or not, in the 1700's , this was a form of jewelry! Silver Prices Soar and Hit Record High Prices!! The cost of silver (and other precious metals) has dramatically increased - in 2008, precious metals reached the highest price point in more than 20 years! Yes...silver, gold, and other precious metals rise and fall along with the oil market prices. So, if you see the prices rising at the gas pump, then the precious metal jewelry prices are rising, too. Click here for latest silver prices and news. So...what does this mean to you? Well...there is good news and bad news. The good news is the economy is strong enough to support the increase in silver and your silver jewelry is now worth more. The bad news is the current price for silver products is on the rise. Wholesalers have increased their prices to the retailers by 80-300%! This means that you, the consumer, will be paying more in the end. It is our policy to sell items to you based on the wholesale cost we paid. This means we do not automatically increase retail prices; however, as current inventory is sold, prices are going to eventually go up. Get your orders in as soon as possible to get the best price! It is a big problem on eBay! 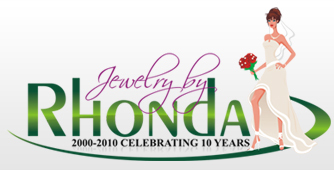 Our jewelry description policy and what we do to protect you. Where did Birthstones come from? Well during the time of Moses, 12 gemstones were featured on the Jewish High Priest's Breastplate of Aaron. Each stone represented 1 of the 12 Tribes of Israel. It was not until the 18th century gemstones started to be worn to represent birth months. Initially, it was much less important to wear your birthstone. It was more important to wear the stone that contained the "power" to cure what ailed you - you were to own all twelve stones and wear them throughout the year. Garnet is a lovely vibrant red gem. Garnet symbolizes faith, truth, grace, sincerity, loyalty and fidelity. Garnets have been "known" to stop hemorrhaging, cure inflammatory diseases, and cure anger and discord. The Garnet family of gems is one filled with hard durable stones. Garnets are minerals and crystals that develop within rocks and cavities. Garnet comes in colorless, white, gray, black, red, pink, yellow, orange, brown and green. 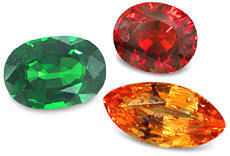 Garnets come in every color except blue - the greatest variety of color of any mineral. There are some garnets that even change color. During the Bronze Age, Garnet was part of Christian and Jewish mythologies: a radiant red garnet guided Noah through the great flood. The name Garnet may have come from the pomegranate fruit because of its reddish color seeds. Tsavorite garnet is sometimes mistaken for green emerald. 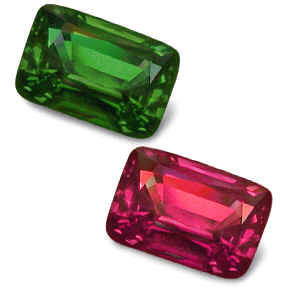 Actually this green garnet is clearer, more brilliant, and more durable than the emerald. There are shades of red garnet that are mistaken for rubies. Rhodolite garnet is considered to be the most desirable garnet with its violet/pink color with no orange hue. 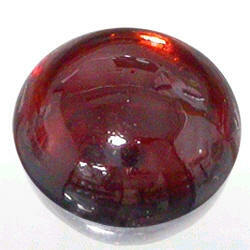 Garnet is sometimes called the Stone of Constancy. 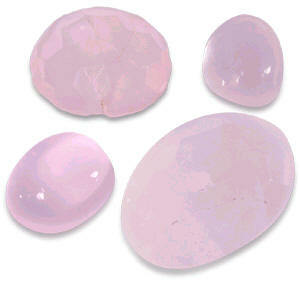 Rose Quartz is a light to deep pink mineral. It is opaque (nontransparent) and translucent, and a reasonably hard stone. The creamy pink color is very delightful - you will see colors from almost white to light/medium pinks. 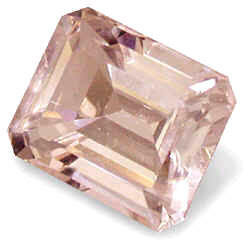 The opaque lines of pink in the stone come from titanium and other natural inclusions. Rose Quartz has been popular for many years for a variety of uses: everything from jewelry to statues. It is believed Rose Quartz heals broken hearts. Amethyst Amethyst is a rich purple color semiprecious gem. It can be deep purple, lilac or mauve. Pale lilac is sometimes called "Rose de France." Amethyst is a variety of quartz crystals found in volcanic rock. Amethyst is relatively hard and brilliant - an overall versatile and wearable stone. Ancient Greeks believed Amethyst protected them against drunkenness and passion. It's name is derived from the Greek word "amethystos" meaning "not drunken." According to Greek mythology, Dionysus, the god of wine, was angered one day by an insult from a mortal. He swore revenge on the very next mortal he crossed paths with. Along came Amethyst, a beautiful young maiden on her way to pay tribute to the goddess Diana. Diana turned her into pure quartz to protect her from Dionysus' tigers. Dionysus wept tears of remorse at the sight of the beautiful statue and the quartz turned purple. Medieval European soldiers wore Amethyst for protection during battle. It symbolizes sincerity, peace, protection and tranquility. Amethyst is sometimes called the Stone of Sincerity. Amethyst is in the British crown jewels. Catherine the Great loved amethyst. During the middle ages, it was thought to encourage celibacy - very important to the church. Today, some bishops still wear amethyst rings. African Amethyst is regarded as the highest grade of Amethyst with its medium dark purple color with no black hue. It usually has a better and more saturated color. Amethyst may fade if exposed to severe heat and excessive sunlight. 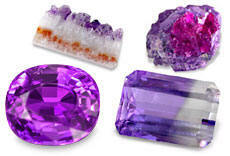 Amethyst is one gem that can be cleaned in an ultrasonic cleaner with cleaner of warm soapy water. Black Onyx Onyx is a lovely semi-translucent to opaque quartz. It naturally comes in a variety of colors - red, orange, shades of brown, green, etc. The Indians and Persians believed wearing onyx protected them from the "evil eye." The name came from the Greek word "onux" meaning "fingernail." The legend is Cupid cut the fingernails of Venus while she was sleeping. He left the clippings on the sand and they turned to stone. During Greek times, all colors of chalcedony were called onyx. 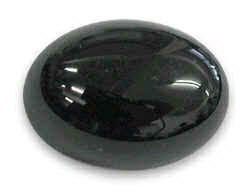 Black onyx, the most popular version of onyx, is not true onyx at all and is not naturally black. It is chalcedony (another version of quartz) and is dyed black. Sardonyx is reddish-brown and white onyx. It was highly prized in Rome for royal seals because it would not stick to the wax. Moonstone Moonstone is a member of the feldspar family. The feldspars are a group of minerals found in many rocks (particularly granite, volcanic and metamorphic). 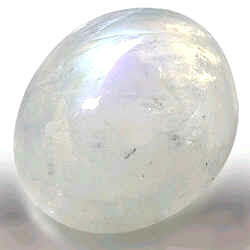 It is a transparent, milky-white color with floating opalescent white and blue light within the body of the stone. The shimmer is caused by the intergrowth of two different types of feldspar with different refractive indexes. 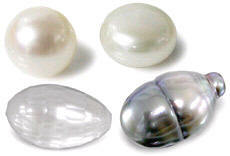 Moonstone can be colorless, gray, brown, yellow, pink, green, transparent or translucent. Rainbow moonstone is labradorite feldspar with a variety of rainbow hues. Labradorite is feldspar with a dark background that emits a multicolored shimmer. The name "moonstone" probably came from the myth that one can observe the lunar month through the stone. A new moon is a small spot that gradually gets larger until it takes the shape of a full moon in the center of the stone. The Romans thought moonstone formed from rays of moonlight. Moonstone is a good luck stone. It is believed to arouse a lover's passion. Legend has it moonstone assisted crops for greater yields. Aquamarine Aquamarine is sky blue, blue-green or dark blue in color. It gets its name from two Latin words that mean "sea" of "water." 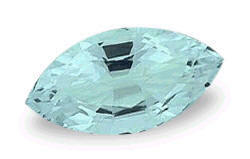 Aquamarine is beryl (same as emerald) and is a semi-precious gem. Ancient Greeks believed Aquamarine held the essence and spirit from the sea. Sailors wore Aquamarine for bravery. According to legend, aquamarine is the treasure of mermaids and will keep sailors safe at sea. It is said to protect against the wiles of the devil. A dream of aquamarine means you will meet a new friend. It symbolizes beauty, honesty, loyalty. Legend is that to wear aquamarine earrings will bring love and affection. 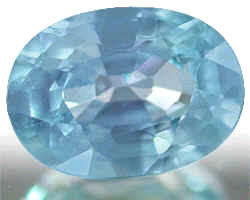 It is said aquamarine will re-awaken love in long-time married couples. Aquamarine is a good anniversary gift because it is said to have a soothing influence on married couples, helps them work out difficulties and ensures a long, happy marriage. It is sometimes called the Stone of Courage. Rock Crystal Rock Crystal is quartz. It is water clear and transparent. 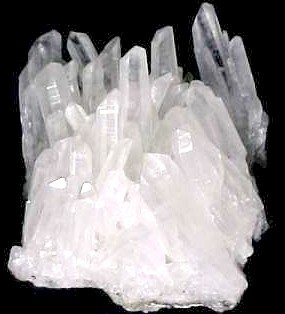 Rock crystal has been used for years for jewelry-making. Diamond The "King Gem". The name diamond comes from the Greek word "adamas" meaning unconquerable. Diamonds have been the traditional symbol of love since ancient Greece. A diamond is pure natural carbon. It is harder than any other natural or artificial substance known. It is the only stone whole value is determined by precise rules (4 C's). Take it from a woman, a diamond has few weaknesses and many strengths! The diamond has been one of the most coveted gems in history. A diamond is internationally recognized as a symbol of love and betrothal. A diamond is sometimes called the Stone of Innocence. For a natural alternative to a diamond (not cubic zirconia) there is white zircon, white topaz, white sapphire and white emerald. Mother-of-Pearl Mother-of-Pearl is the hard, iridescent inner layer of certain shells such as abalone, oyster and mussel. It is also called nacre, the calcium carbonate deposits. This material is deposited in thin overlapping layers. The beautiful iridescent colors you see in mother-of-pearl is caused by reflective light waves. Mother-of-Pearl has a long history in both eastern and western cultures for inlays, decorative finishes, ornamental objects and jewelry. Emerald Emerald is the "gem of eternal spring." 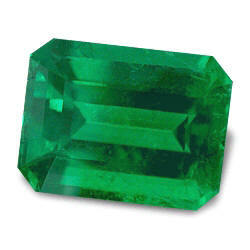 Emerald is green beryl crystals found in cavities of pegmatites (ex: granite). It is a precious gem. The emerald has always been treasured. According to legend, the emerald was believed to bestow faithfulness and unchanging love. It was also believed to strengthen memory and quicken intelligence. Emerald is sometimes called the Stone of Success and Love. Look for a fine green color with minimal inclusions. Columbian emeralds are considered to be the world's finest emeralds. Although the emerald is a hard stone, it is brittle and will chip easily. Emeralds were Cleopatra's most prized gems. Shah Jahan, the builder of Taj Mahal, loved emeralds so much, he inscribed them with sacred text and wore them as talismans. Some of these sacred stones, called the Mogul Emeralds, can be seen in museums and collections today. Special care should be given when wearing emeralds. Filling surface cracks on emeralds with oil is a common practice that dates back to early Greek times. It is actually good for the stone - filling fissures and fractures characteristic of emeralds. Emeralds should never be cleaned in ultrasonic cleaners because it will strip away the oils. Clean your emeralds with a dry soft cloth. 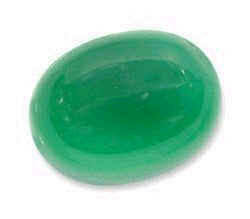 Green Onyx Read about Onyx. Alexandrite Fine natural alexandrite is very rare and expensive. Alexandrite is chrysoberyl found freestanding or in pegmatites. It is truly a fascinating transparent gem. Alexandrite is a stone that changes color based on the light. It is a raspberry red stone in artificial light and a grass green stone in daylight. (An emerald by day and a ruby by night.) It is quite unique and beautiful. Alexandrite is more expensive than diamonds - upwards of $10,000 per carat. The mines in the Russian Ural mountains have long closed. Alexandrite was discovered in Russia in 1831 on the day Czar Alexander II reached his majority, hence the name. The Russian imperial colors are green and red. Tiffany and Co. produced alexandrite rings in the late 19th and early 20th centuries. A gift received of alexandrite is considered a good omen. It is sometimes called the Stone of Health and Longevity. 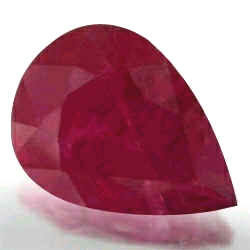 Ruby Ruby comes from the Latin word "ruber" meaning red. Ruby is a precious gem usually found as crystals within metamorphic rock. One example of metamorphic rock is marble. The gem name for this stone is corundum, the second hardest natural mineral (the first is diamond). All other corundum stones all called sapphires - only the red color is called ruby. A ruby should be a beautiful red shade and eye-clean. The amount of chromium and iron determines the redness of color. Ruby is sometimes called the Stone of Contentment. Ruby symbolizes success, devotion, integrity. It is thought to ward off misfortune and ill-health. Ancient lore is that ruby is capable of reconciling lover's quarrels. A ruby engagement ring expresses passion and promise of the heart. The finest ruby comes from Myanmar. Ruby is mined in the US - Georgia, North Carolina and Wyoming. Jasper Jasper is chalcedony (dense microscopic quartz like onyx) that is a opaque earth tone color (brownish colors). There are more than fifty types of jasper in various colors and patterns. The name jasper comes from the Greek word "iaspis" of Semitic origin. In ancient writings this term was chiefly applied to translucent and brightly colored stones, particularly chalcedony. Jasper was believed to bring rain in ancient cultures. Because of the colors and vein like patterns, it was believed to have many uses and magical powers. Jasper offers interesting color contrasts and varieties and is being used more in contemporary jewelry designs. Black jasper has been used for many years as a "touchstone" to test gold and silver alloys. Rub the jasper stone with the metal and the color of the streak determines the gold content within 1/100th accuracy. Peridot Peridot is a lively uniform lime or olive green color. 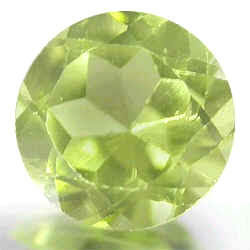 It is found in igneous and volcanic rocks - volcanic action actually creates Peridot. It is the mineral olivine - magnesium and iron-rich silicate. Peridot is sometimes called the Stone of Friendship. It symbolizes fame, dignity and protection. It is said to bring the wearer success, peace and good luck. Ancient Egyptians called Peridot the "gem of the sun". Egyptians started mining Peridot in 1500 BC. They mined at night when the stone's natural glow was easier to see. Cleopatra had a Peridot collection. Peridot was very common in early Greek and Roman jewelry. The Romans called Peridot "evening emerald" because it did not darken at night and was still visible by lamplight. Pirates believed Peridot would drive away evil spirits and night terrors if the stone was pierced, strung on donkey hair and worn on the left arm. In the US, Peridot is mined in Arizona, Colorado, Hawaii and New Mexico. Carnelian Carnelian is reddish brown chalcedony (quartz - please see jasper). This color is caused by hematite (iron oxide). Carnelian is more translucent than it's jasper cousin. Carnelian has long been used by the Greeks and Romans for rings and signets. G. F. Kunz, a turn-of-the-century gemologist and historian, recommended the timid and weak voice people should wear carnelian. He said the warm-colored stone would give them the courage they lacked. The end result, the wearer would be able to speak boldly. Napoleon I always wore an engraved carnelian and bequeathed it to his nephew. Sapphire The gem of the heavens. The divine gemstone. Blue sapphire gets its color from the irm and titanium found in corundum. Sapphire is a precious gem of corundum. Except for ruby, all corundum is called sapphire. 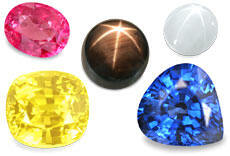 There are many colors of sapphire available: blue, pink, yellow, orange, violet, green and colorless. Blue Sapphire is sometimes called the Stone of Clear Thinking. Kings wore sapphire around their neck as a powerful defense against harm. It was believed sapphire preserved the wearer from envy and attracted divine favor. Ancient Persians believed the earth rested on a giant sapphire and its reflection colored the sky. Sapphire represents truth, faithfulness, sincerity and consistency. A sapphire engagement ring is a symbol of commitment and loyalty. In the US, sapphire is mined in Montana. Lapis Lazuli Lapis has been mined in Afghanistan for more than 7,000 years. The "Armenian Stone" is an enduring rock composite of several minerals - sodalite, calcite and pyrite. Lapis forms in igneous and volcanic rock. The dark blue color comes from the mineral lazurite. It is a very porous stone. For thousands of years, it has been a highly prized stone in Egypt, Persia, Greece and Rome. The name lapis is Latin plus azul which is Aztec for blue. The Romans believed lapis was an aphrodisiac. During the middle ages, it was thought to keep the soul free from error, envy and fear. It symbolizes power, ability, success and wisdom. 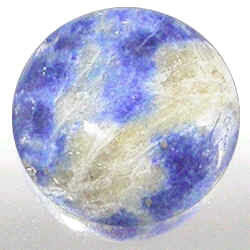 Today, Lapis is a very fashionable stone to wear. To clean lapis, just wipe with a damp soft cloth - do not use cleaners, ultrasonic machines or water. Opal Opal is a semi-precious stone long valued for its play of colors. Opal symbolizes fidelity, hope, happiness, truth, innocence and purity. Opal is also associated with religious emotion and prayer. Opal is sometimes called the Stone of Hope. The name opal comes from the Latin word "opalus" which means "seeing jewel". The English language is quite insufficient to describe this unique gem because of its brilliant mini-rainbow effect. Thus, the term "opalescence" was coined to describe this striking quality. This rainbow is composed of hydrated (5-10% water trapped inside) silica spheres, a very different formation process from other gems. Wavelengths of light are refracted and reflected by the opal. Rich solutions of opal can be found in cavities of sedimentary and volcanic rock. 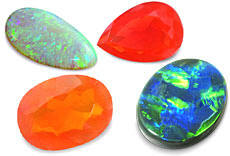 Look for pure color and absence of dead spots in opals. Opals are set in the crown jewels of France. During ancient times, opal symbolized faithfulness and confidence. To Romans, opal symbolized hope and purity. To Greeks, opal symbolized foresight and prophecy. The Arabs believed opal fell from heaven in flashes of lightning. Shakespeare referred to opal as the "Queen of Gems" in Twelfth Night. In Sir Walter Scott's novel Ann of Geierstein, the novel's heroine owned an opal that had her life force caught inside. It burned fiery red when she was angry. The opal's fire extinguished and turned ashen gray upon her death. Napoleon gave Josephine an opal named "The Burning of Troy" as a symbol of his love. Opals require special care because they will dry and crack. Rub opals with oil to moisturize and preserve them. Protect them from heat and detergents. Do not let opals dry out. 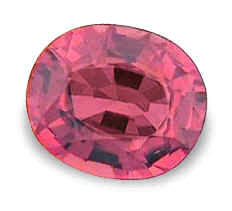 Pink Tourmaline Tourmaline comes in many colors and hues. 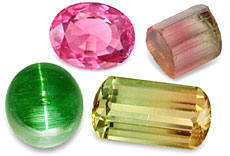 Tourmaline is mined in the US in California, Texas, Connecticut, Maine and New York. Legend is tourmaline will protect you from danger and misfortune. During the Manchu Dynasty of China, members of the Mandarin class wore round buttons of red tourmaline to distinguish themselves from other classes of citizens. Empress Tzu Hsi was fascinated with the colors of Tourmaline and had more than 1 ton in her jewelry collection. Topaz Topaz is free-growing crystals of an aluminum silicate mineral. It can be colorless, yellow, blue, etc. Topaz got its name from the Greek work meaning "to shine" and it also implies "fire." The Greeks believed topaz gave the wearer strength. The Egyptians believed the golden glow from topaz protected them from hardships. The Romans believed topaz was associated with Jupiter, the god of the sun. The most famous topaz is in the Portuguese crown jewels and is called the Braganza. Topaz is mined in the US in Colorado, Maine and Utah. Citrine Citrine got its name from the French word "citron" for lemon. 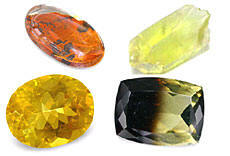 Citrine is a quartz that is deep yellow/orange in color and should have minimal brown tones. Citrine occurs as crystals in pegmatites. It is easy to scratch and the sun will fade its color. During ancient times, people carried citrine to protect them against evil thoughts. Citrine is believed to promote happiness and be useful against depression. It symbolizes hope, youth, health and fidelity. Citrine is sometimes called the Stone of Wealth. In the US, Citrine is mined in California, Colorado. Georgia and Nevada. Blue Zircon Blue zircon is a form of hyacinth found in pegmatites and igneous rock. 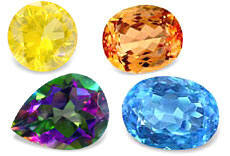 Zircon can be colorless, blue, yellow, red, pink, etc. Colorless and blue zircon are more rare. Blue zircon is sometimes called the Stone of Prosperity. During the middle ages, zircon was used to aid sleep. It was believed to bring prosperity, and promote honor and wisdom. Blue Topaz Blue topaz represents fidelity. The three colors of blue topaz are: Sky, Swiss and London. Turquoise Turquoise is found as solid masses in the cracks of aluminum-rich rock. It can be any color from sky blue to green. It is a hydrated phosphate of copper and aluminum. Turquoise is often sealed with acrylic to enhance the color, texture and hardiness. It is believed to warn the wearer of danger and illness by changing colors. In the 13th century, it was believed turquoise protected the wearer from falling. Turquoise was worn by Pharaohs and Aztec kings. The name is from the French word "pierre turquin" for "blue stone" . The oldest know mines were found in Persia and Egypt. According to legend, Native Americans believed if turquoise was affixed to their bow, the arrow would always hit its mark. They also believed turquoise would bring happiness and good fortune. In the US, turquoise is mined in Arizona, California and New Mexico. Do not clean turquoise with hot water, a steamer or an ultrasonic cleaner. Do not expose it to cleaning agents or other chemicals. Protect turquoise from scratches, hard blows, hot water. Learn more about minerals and gemstones.